I once bought some cassettes on Koninginnedag from a guy who had a whole box of tapes. 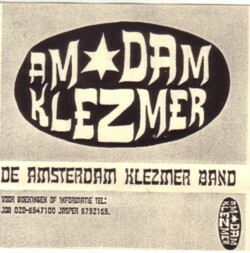 I bought it because the name of a band on one of the tapes sounded interesting: De Amsterdam Klezmer Band. While I was going through the box of tapes, the guy asked ”What kind of music are you looking for?” I held up one the tapes and said ”This!” “Well, that is my band” , answered the guy. The Amsterdam Klezmer Band is still alive and kicking, with a new CD coming out this autumn and with several LP’s and CD’s that you can buy here. On their website there is a discography that also mentions two cassettes, but not the one that I am listening to while I type this. Or is this ”Mesjogge” ? I have no Jewish blood, but everything about Jewish culture touches me deep. I don’t have that with any other religious culture. I don’t believe in reincarnation, but if I did, I would believe that I was an orthodox Jew in a previous lifetime. It is not only the Jewish music and the culture that touches me, but especially the language. If i had more time, i would go deeper into this, but that will have to wait till another time.